The omentum is rich in lymphatics and blood vessels. The omentum becomes densely adherent to intraperitoneal sites of inflammation for prevention of localized pathology to diffuse peritonitis. Omental infarction is a rare cause of acute abdomen with an incidence equivalent to <4 per 1000 cases of appendicitis. 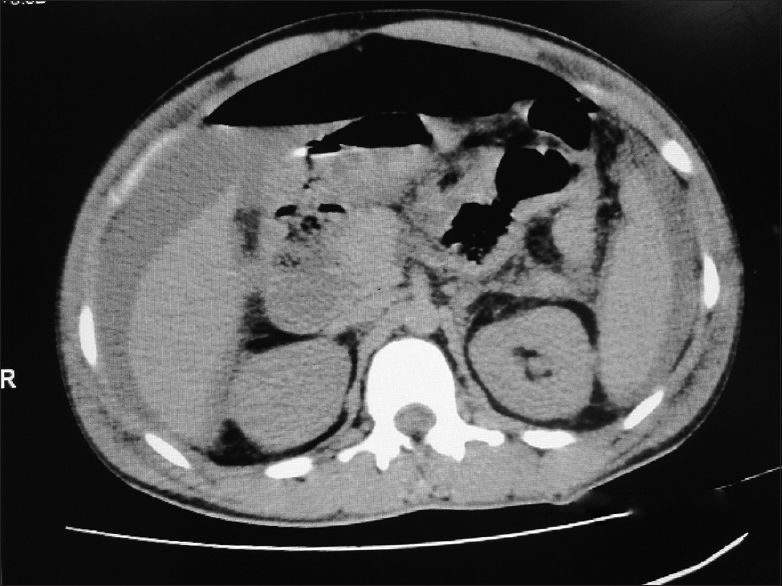 Low incidence and nonspecific presentation contribute to omental infarction being misdiagnosed for appendicitis, peptic ulcer disease, cholecystitis, and pancreatitis among other abdominal pathologies. This study is about a45-year-old male patient who is a known alcoholic and smoker for 20 years. He was admitted with complaints of abdominal pain for 4 days associated with history of nausea and vomiting for 3 days. On examination, the patient was conscious and febrile. Pulse rate - 110/min and blood pressure - 80/60 mmHg. Abdominal examination showed distension with guarding and rigidity. Tenderness was more on the epigastric region. Free fluid was present. On auscultations, bowel sound was absent [Figure 1]. Investigations showed anemia with leukocytosis. Renal function test showed elevated urea and creatinine with hypokalemia. Liver function test showed elevated bilirubin. 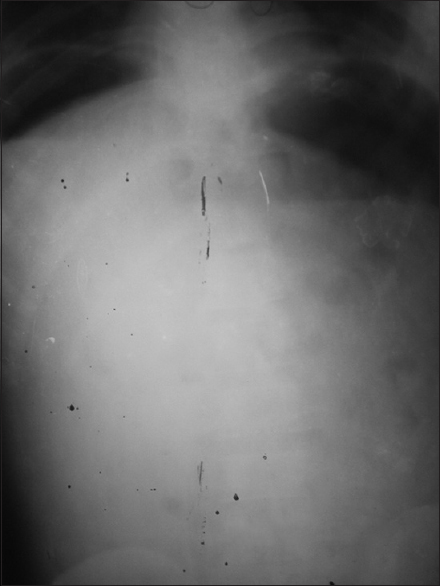 Erect abdominal X-rays showed free gas under diaphragm [Figure 2]. Computed tomography (CT) abdomen showed free fluid [Figure 3]. Abdominal paracentesis showed black fluid aspirate. Preoperative diagnosis made as hollow viscus perforation and laparotomy done. 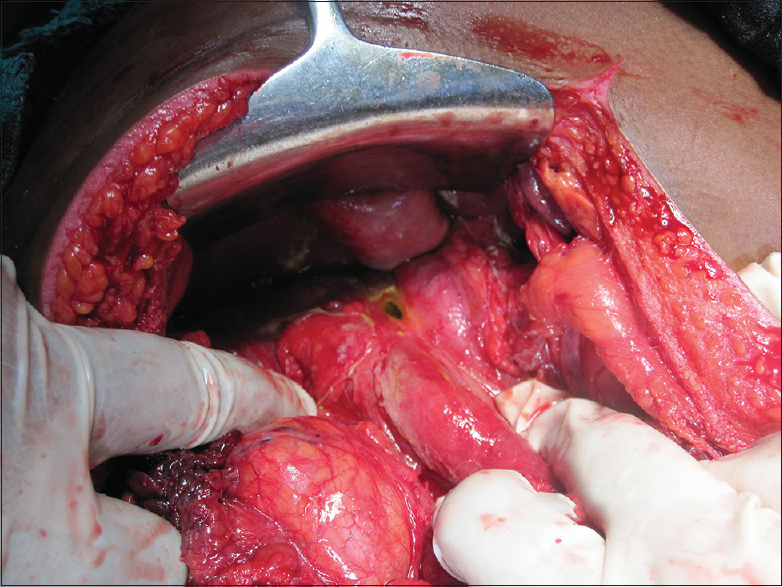 Intraoperative findings showed a single 1 cm × 1 cm perforation in the first part of duodenum with omental infarction [Figure 4] and [Figure 5]. Gangrenous toxic fluid around 3 L was aspirated. 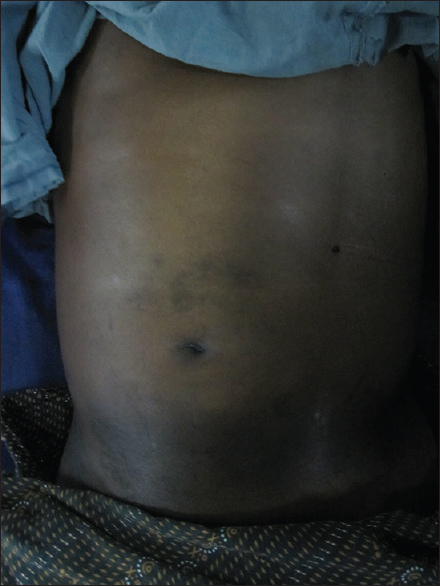 As the patient was in morbid condition, primary closure of duodenal perforation with omentectomy was done along with peritoneal toileting with normal saline. In postoperative period, the patient was on inotropic support because of shock. During third postoperative day, the patient died in spite of resuscitation. Omental infarction is classified as primary or secondary based on etiology [Table 1]. 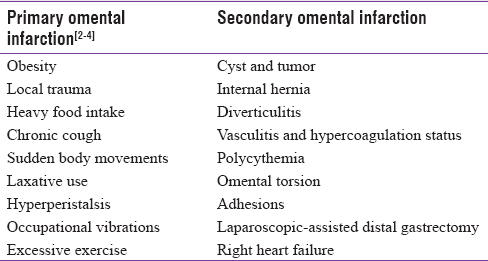 Diagnosis of primary omental infarction is made when there is no cause, whereas diagnosis of secondary made when there is an association with pathology [Table 1]. Pathogenesis of primary omental infarction includes the following: (І) right half of the omentum more commonly involved due to anatomically altered vasculature, less tolerant of spontaneous venous stasis, and thrombosis secondary to stretching of omental veins; (ІІ) fatty accumulation in the omentum impedes the distal right epiploic artery and additional structural mass potentially precipitates torsion; (ІІІ) a longer mobile right side greater omentum potentially prone for torsion-induced omental infarction; (Іv) obesity causes irregularly distributed accumulations of excess omentum and increased fat deposits reduces blood supply to the thickened omentum. Pathogenesis of secondary omental infarction includes the following: (І) secondary omental infarction occurs following omental torsion, which can be precipitated by postoperative adhesions, tumor, hernia, cyst, localized inflammation, or trauma;, (ІІ) thrombosis due to vasculitis and hypercoagulability and polycythemia can also produce secondary omental infarction; (ІІІ) secondary omental infarction also occurs following ligation of omental vessels. Omental infarction is affected by the volume and anatomical location of the remnant omentum rather than the anatomical location of the ligated vessel. The residual area and the abundance of the blood supply for the remnant greater omentum are two important factors that affect the incidence of omental infarction; (Іv) sometimes, it is the result from kinking of venous channels in the inferior part of the greater omentum in the pelvis. Occasionally, omentum twists on itself resulting in omental torsion leading to both arterial and venous compromise. It was first reported by Bush in 1896. Correct preoperative diagnosis of primary omental infarction was possible only in 0.6–4.8% of all cases. Primary cause of omental infarction is generally unidentified and the condition may develop with or without torsion. On contrast CT omental infarction will appear as an ill-defined heterogeneous mass with hyperattenuating streaky infiltration in early stage, and thus progress to a well-defined, smaller lesion with hyperdense rim in the late phase. Concentric linear strands or the whirl sign and hyperattenuating streaky infiltration, both are path gnomonic features of omental torsion. Fragoso AC et al. argue that on collective balance, surgery should not be the first line of management, particularly as better imaging accessibility forgoes the need for surgery. But some authors recommending for surgical management by means of laparoscopic approach is better for considering complication. In most of omental infarction, cases were misdiagnosed. However, proper radiological investigations with diagnostic laparoscopy improve diagnostic accuracy. A high index of suspicion is needed for diagnosis of omental infarction. Secondary omental infarction has poor prognosis compared to primary omental infarction due to underlying disease pathology. The management of omental infarction is accomplished by either conservative or surgical management by patient presentation or through radiological findings. Secondary omental infarction due to hollow viscus perforation is a dangerous combination because loss of omentum allows localized pathology to become generalized peritonitis with higher morbidity with mortality. Hence, early recognition and prompt treatment reduces complications. Itenberg E, Mariadason J, Khersonsky J, Wallack M. Modern management of omental torsion and omental infarction: A surgeon's perspective. J Surg Educ 2010;67:44-7. Theriot JA, Sayat J, Franco S, Buchino JJ. Childhood obesity: A risk factor for omental torsion. Pediatrics 2003;112(6 Pt 1):e460. Wiesner W, Kaplan V, Bongartz G. Omental infarction associated with right-sided heart failure. Eur Radiol 2000;10:1130-2. Kim MC, Jung GJ, Oh JY. 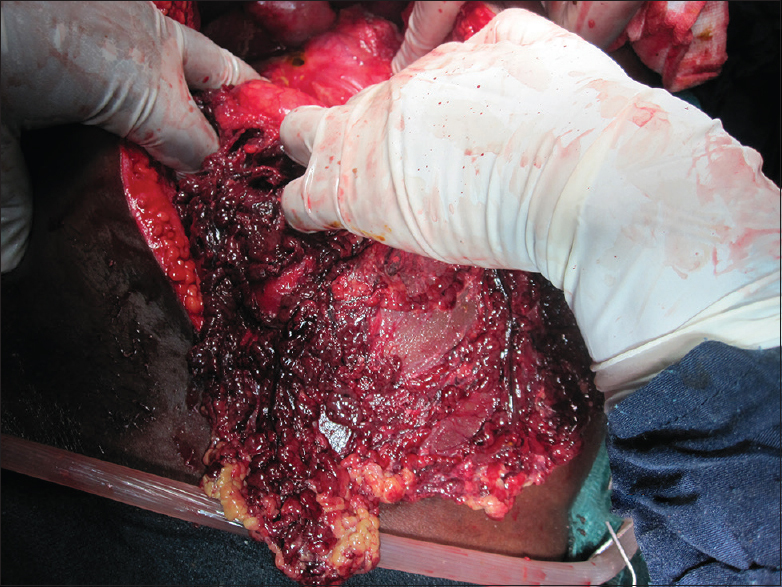 Omental infarction following laparoscopy-assisted gastrectomy (LAC) for gastric cancer. J Korean Gastric Cancer Assoc 2010;10:13-8. Puylaert JB. Right-sided segmental infarction of the omentum: Clinical, US, and CT findings. Radiology 1992;185:169-72. Park TU, Oh JH, Chang IT, Lee SJ, Kim SE, Kim CW, et al. Omental infarction: Case series and review of the literature. J Emerg Med 2012;42:149-54. Patel RV, Dawrant M, Scott V, Fisher R. Omental infarct in a hernia: An unusual cause of paediatric acute scrotum. BMJ Case Rep 2014;2014. pii: Bcr2014203614. Cervellione RM, Camoglio FS, Bianchi S, Balducci T, Dipaola G, Giacomello L, et al. Secondary omental torsion in children: Report of two cases and review of the literature. Pediatr Surg Int 2002;18:184-6. Patle NM, Tantia O, Das PC, Mukherjee J, Prasad P. Omental gangrene and porto-mesenteric thrombosis in a patient of protein C and protein s deficiency. Indian J Surg 2013;75 Suppl 1:409-11. Park KE, Chung DJ, Kim W, Hahn ST, Lee JM. Secondary omental infarction related to open and laparoscopic-assisted distal gastrectomy: Report of two cases. Korean J Radiol 2011;12:757-60. Singh AK, Gervais DA, Lee P, Westra S, Hahn PF, Novelline RA, et al. Omental infarct: CT imaging features. Abdom Imaging 2006;31:549-54. Fragoso AC, Pereira JM, Estevão-Costa J. Nonoperative management of omental infarction: A case report in a child. J Pediatr Surg 2006;41:1777-9.